The EM-Tec versatile SEM stage adapters for Zeiss/LEO SEMs, FESEMs, CrossBeams and FIB-SEM systems consists of the Zeiss / LEO compatible universal dovetail with an M4 screw. 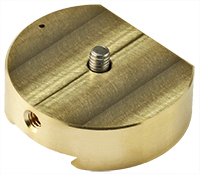 These stage adapters are compatible with all EM-Tec SEM sample holders with M4 threaded hole. The total height of the EM-Tec ZV9 stage adapter for Zeiss / LEO is only 8mm. The height of the EM-Tec ZV11 stage adapter for Zeiss/LEO systems with an airlock is only 11mm. Ordering information for the EM-Tec versatile SEM stage adapters for Zeiss/LEO SEMs, FESEMs, CrossBeams and FIB-SEM systems.